At Flux Factory in Queens, Tongue Tide treats other languages as treasure chests of unique expressions. Are you ready for volumptuous? 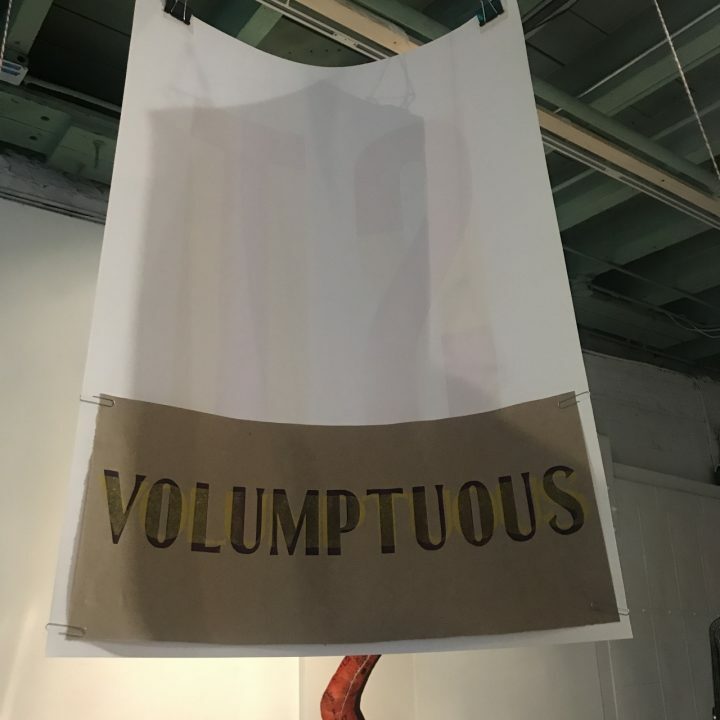 This hilarious sign by Purgatory Pie Press dangling from Flux Factory’s ceiling, part of “Volumptuous: Hanging Tower of Babble,” a large installation of hanging signage, is a fitting mascot for this playful summer show. 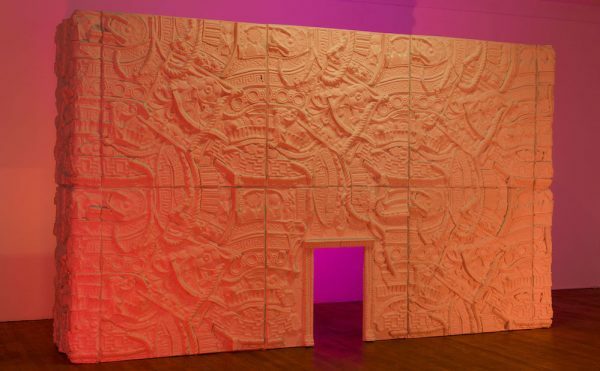 Tongue Tide, curated by Christina Freeman and Emireth Herrera, invites us all to play a little more with language, and to ponder other languages besides English. It’s a must-see for writers and wordsmiths and is well worth the trip to Long Island City. Queens is the most linguistically diverse area on the planet. 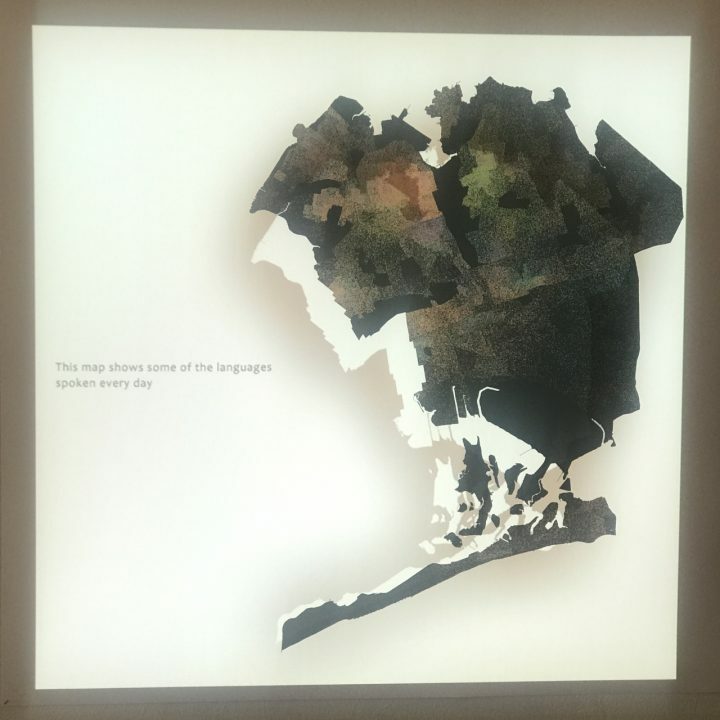 No other place boasts so many languages in such close proximity, something Rashedul Hasan and Dan Silverman illustrate in “We Are the Queens of New York” (2017), a map piece where dots of different colors represent these many varied languages. 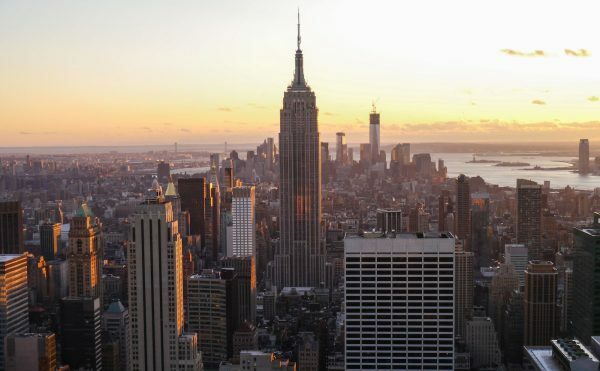 It’s really powerful to dwell on just how unique the borough — and New York City as a whole — is from this perspective. It’s also good to ponder this map because, with all due to respect to Oscar Wilde and Dorothy Parker, English does not own a monopoly on wit. Many turns of phrase and poetic expressions in other languages pack a punch, even in translation. Some of the best work in this show plays with other languages to give us glimpses of their clever bons mots. An intriguing artist book by Magali Duzant, A Light Blue Desire (2017), complies blue bromides from across the globe, and blue postcards featuring some of the selections are available for visitors to take home. Blue, in word and concept, can be stretched in so many semiotic directions. The blues are great, but they cast a sad shadow on the color as a metaphor in today’s English, which is further exacerbated by the minority status of the so-called blue states in the US’s broken political system. But blue is not so sad in other languages. One vivid example is the Polish expression for what we might call daydreaming: to think about blue almonds. It captures the futility of idle fantasy so well. 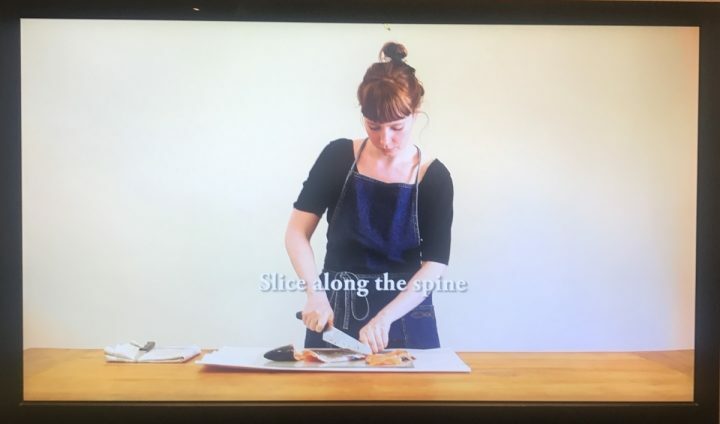 Nina Ross’s video piece “Untitled #1 (Fish)” (2017) shows a woman filleting a fish and learning Norwegian by getting directions for each next steps in that language. She’s not fluent, and we watch her linger on words she doesn’t recognize, then learn and internalize them by doing. There are some puns here because, with all due respect, the Norwegian vocabulary sounds, to my English ears, a bit squishy — like fish. Given that fish has been a major food staple in Norway for centuries, it’s intriguing to reflect on how Norwegian terms for its preparation can function as onomatopoeia. 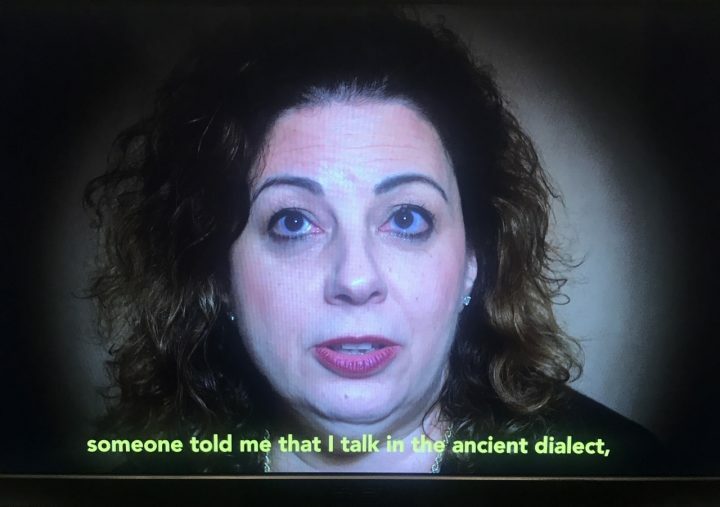 Eugenio Pizzorno’s video “Ripples 01” (2017) explores ancient dialects of Italian that are still spoken by some Italian Americans in New York City today. As the woman on camera explains at one point, her mother loved certain phrases in the old dialect for which she could find no cognate in English, such as puzza schiatta. A crude literal translation for it might be “I hope you die,” but there are resonances and contexts to the phrase that an online translator can’t uncover, and this indescribability is at the heart of the video. Now, it’s debatable whether or not Donald Trump actually speaks English, or even deserves the dignity of a paragraph in this review. A case could be made that he speaks his own crude, over-simplified dialect; coming from Queens himself, perhaps he is trying to add to its diversity? 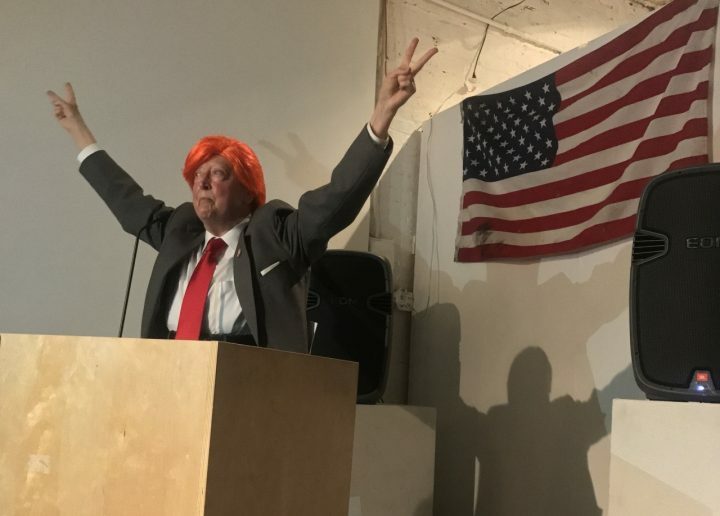 Martha Wilson turned up to the exhibit opening decked out in suit and orange wig, and her short performance imitated his bluster and butchered prose. 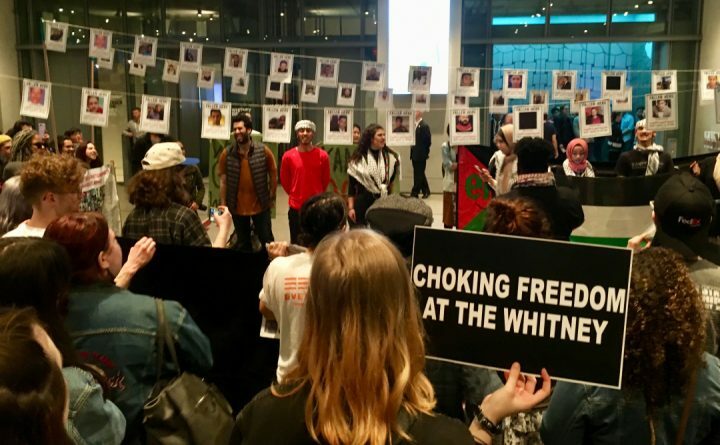 Then, in her own voice, she talked about how New York’s art and activism scenes have been intertwined since the 1970s, and she recounted the political crisis that each era confronted. It made me wonder how our stories about the 2010s will sound in 2050. It also warmed my heart, reminding us all that those who came before us had to fight just like we’re trying to do today. They like you because you eat dog, goat, and pig’s blood. They like you because you grind your women they way you eat pulutan. They like you because you drink, play mah-jongg, and cockfight. They like you because you kneel hard, bend over quick, and spread wide. They like you because you worship blue passports. They like you because you guard the exiled President’s body in Temple Valley. They like you because your daughters date marines. They like you because you machine-gun your own kind. They like you because your sons smoke crack, cut class, and sport tattoos. They like you because you wear rainbow-colored clothes, toupees, and can boogie. It’s a prescient piece, and one that speaks to this show as a whole: The aesthetic trap of “third-world hip” can interfere with appreciating its nuances. But Tongue Tide’s emphasis on language offers a ladder to rise above it. 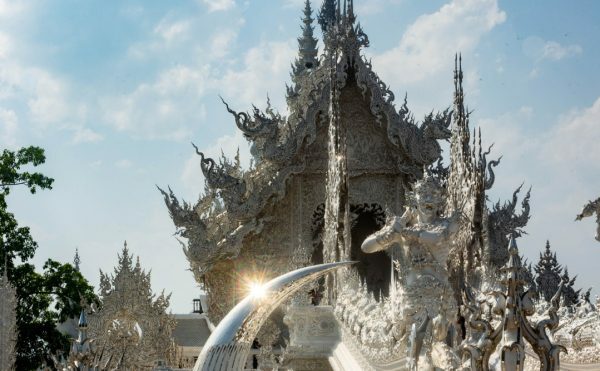 Every culture has its great wordsmiths whose expressions and proverbs live on and circulate long after their death. By one count, William Shakespeare coined 135 phrases that are still used in modern English. Many other languages have their own writers who have left a legacy of semantic gems for future generations. Tongue Tide is at its strongest when it treats other languages as treasure chests of unique expressions. As artists continue to search for ways to help us understand each other better and bridge divides, this show offers an important hint about the role that exploring one anther’s idioms and bromides can play. 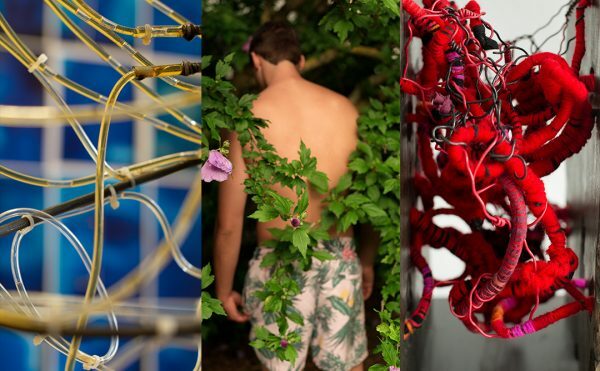 Tongue Tide continues at Flux Factory (39-31 29th Street, Long Island City) through July 30.